For nearly three decades, Rosalie David has directed the mummy research project at the Manchester Museum at Britain's Manchester University, home of one of Europe's finest Egyptian antiquities collections and one of the oldest research institutions in Egyptology. ARCHAEOLOGY spoke to David about her work with the Manchester Mummy Research Project and her latest book Conversations With Mummies, published this past October by William Morrow. 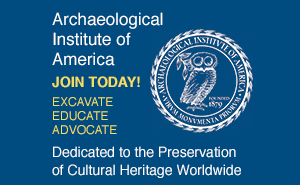 Manchester has one of the oldest programs in Egyptology. Could you tell us something about the program you inherited and your role in shaping it over the past 30 years? RD: The Manchester Egyptian collection was started in the 1890s with objects from the excavations of William M. Flinders Petrie. When I came to Manchester in 1972, the museum had not had an Egyptologist on the staff for about 25 years. One of the first things I did was to establish the Manchester Egyptian Mummy Project in order to investigate the 24 human and 34 animal mummies in the collection using scientific techniques. We have developed this over the past 30 years, pioneering the radiographing of mummies under near ideal conditions in the hospital and the medical school. Before our project, mummies were X rayed with portable equipment in museum galleries or at archaeological sites. 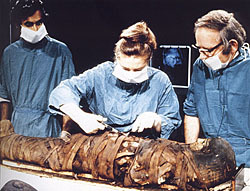 We have also examined the mummies with endoscopes, a virtually non-destructive technique, to investigate and take tissue samples from them. When Margaret Murray brought together a team of medics and scientists to investigate two mummies in the Manchester collection in 1908, it was a real watershed in mummy research. It placed such studies on a scientific and academic basis, instead of the frivolous "unrollings" of mummies performed in front of society audiences in the early nineteenth century. 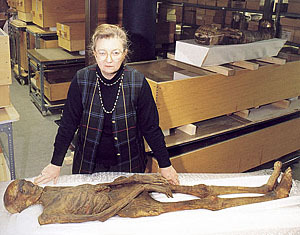 Among Manchester's 24 mummies you have some interesting subjects. Tell us about a few of them. RD: Yes, we have Asru, who was a Chantress of Amun in the Temple of Amun at Karnak around 900 B.C. She has been extensively examined, and we have found that she suffered from a range of diseases including sand pneumoconiosis, a hydatid cyst in the lung, strongyloides and schistosomiasis (both parasitic diseases), and arthritis. The Two Brothers, who were unwrapped by Margaret Murray, are interesting both in terms of their diseases--parasitic diseases, arthritis, pleurisy, sand pneumoconiosis--and also because anatomically they are so different that, genetically, they could not have been full siblings. They may be half-brothers or one may have been adopted--we plan DNA tests to find out the truth, if possible. Natsef-Amun, Keeper of the Sacred Bulls of Amun, belongs to Leeds City Museum. He was autopsied in 1825, and studied again by us in 1992. When he died, his tongue was so swollen that it could not be pushed back into his mouth, probably the result of an insect bite. 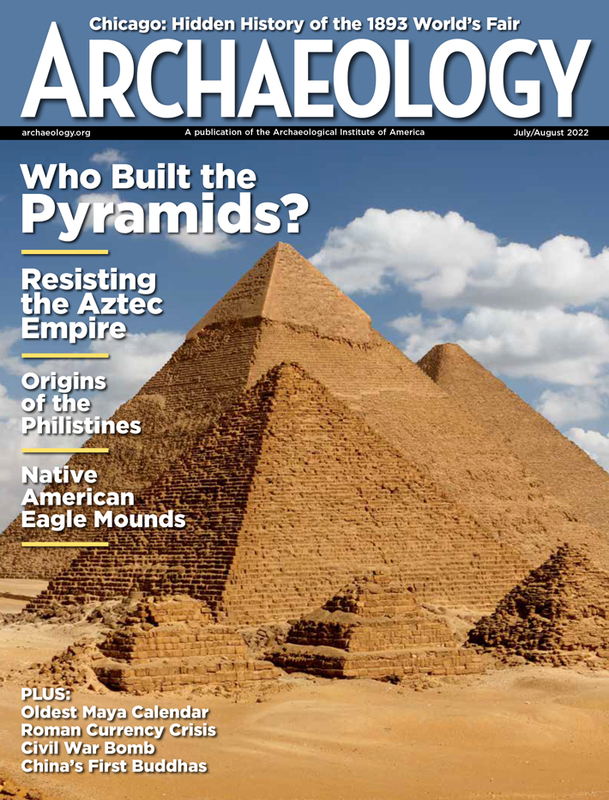 Speaking of disease, what do you consider the most interesting pathology found in the mummies to date? RD: Perhaps the most interesting pathology we have found was in mummy No.1770, which we autopsied in 1975. We found evidence of Guinea worm infestation--radiography revealed the calcified remains of a male Guinea worm in her abdominal wall. Her lower legs had been amputated probably about two weeks before death, possibly because they were ulcerated as the result of trying unsuccessfully to extract the female Guinea worms which sometimes try to break out and emerge through the skin on the legs. We have been led to believe that DNA is rarely preserved in mummies because of the passage of time and embalming methods. Has Manchester had much luck in recovering genetic material from mummies? RD: There are considerable difficulties in identifying DNA in mummies. However, we have had success in Manchester with several mummies, including Natsef-Amun. Currently, we are attempting to identify parasite DNA in some of the mummies. Could you tell us something about the mummy tissue bank you are developing? RD: A few years ago, we decided to establish at Manchester the International Egyptian Mummy Tissue Bank, so that there would be a resource of material that would be available for research undertaken by ourselves and others, particularly in relation to the study of disease patterns. We approached 8,000 institutions worldwide (outside Egypt) to ask if they possessed mummies and if they would be interested in contributing samples to the bank. The bank is now developing, and currently there are several research projects that are using tissue samples. Did ancient Egytians suffer the same diseases common in Egypt today? RD: The ancient Egyptians suffered many of the same diseases as those commonly found in Egypt today. In particular, they suffered from a variety of parasitic diseases. We are currently studying one of these--schistosomiasis or Bilharzia--over a 5,000 year period, in co-operation with the Egyptian Ministry of Health. They have a long-term program to assess the incidence, diagnostic methods, and treatment of this disease in Egypt today, and have data on 100,000 cases. Our Manchester team is building up a picture of the pattern of the disease in ancient Egypt, using the tissue bank samples and immunological tests specially developed in Manchester as a diagnostic tool to identify the presence of the disease in mummies. Ultimately, we will compare the patterns and development of the disease over 5,000 years, and try to determine if the genetic make-up of the causative parasite has changed over that time span. This may help to inform preventative treatment methods being developed for use in modern patients. What does the future hold for the Mummy Project? RD: The Mummy Project has, I believe, added a new dimension to the study of ancient Egypt. Whereas art, archaeology, and literature provide us with only a limited and often propogandistic view of the society, these biomedical studies really tell us what people's lives were like. In the future, we hope to continue to study the patterns and evolution of more diseases from ancient to modern times, and to develope our work on immunological techniques and DNA identification, with particular emphasis on research into viral, bacterial, and parasite DNA. At Manchester, we have a very favorable set of circumstances for this work: a university museum with a fine Egyptology collection, and the availability of expertise in science and medicine in the university departments and the teaching hospitals. At the university, we provide an M.Sc. degree course in biomedical and forensic studies in Egyptology--the only one in the world--and currently, we also have nine Ph.D. students working in this area. With these programs, we hope to train a new generation of scientists to take these exciting studies forward into the twenty-first century. 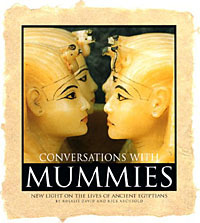 See also our review of recent mummy books, including Conversations With Mummies.